It was another early day today, with the weather intermittently raining in small showers and breaking through in sunny spurts. We got up and had another leisurely brekky beofe heading out, this time to Perth Railway Station. We tried to buy tickets to Fremantle, but struggled with the fact that there were no ticket sellers - only automatic machines. I was looking for a way to buy return tickets and commented so to M. A man next to me helpfully said there were no return tickets - all tickets were valid for two hours. Then when I tried to pay for the $3.70 ticket with a $20 note, M. noticed that the machine only took $5 and $10 notes - which neither of us had. So we had to exit the station up a long escalator and found somewhere to get change - at a currency exchange booth. Then it was back down the stairs again and finally buying the tickets. 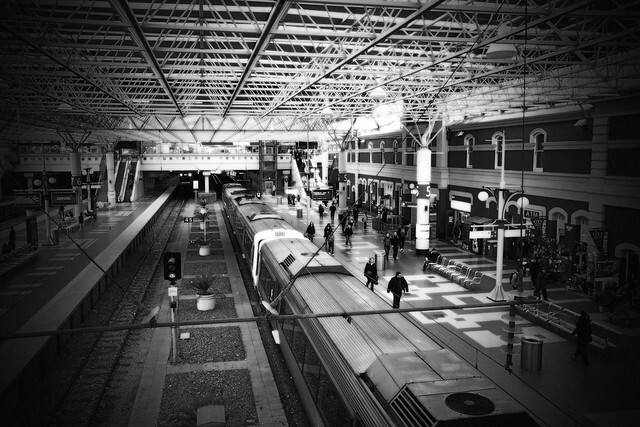 From there, it was a long walk across the breadth of the station to platform 7 and the train to Fremantle. After a ten minute wait, the short train pulled up and we climbed on board and grabbed some seats. 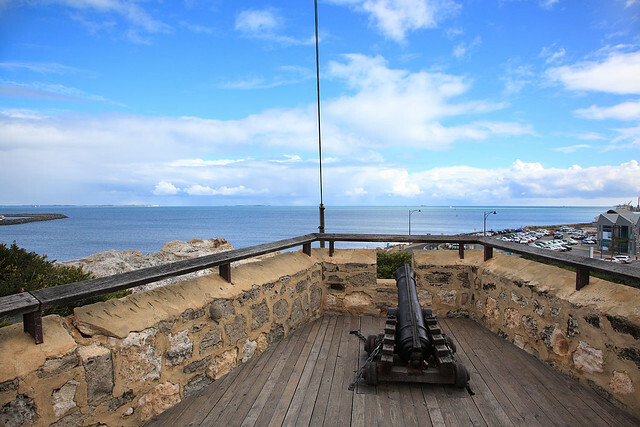 The trip took about 30 minutes, passing through several suburbs of Perth before emerging on the coast at Cottesloe Beach and then tracking south to cross the Swan River near the mouth and end up in Fremantle. 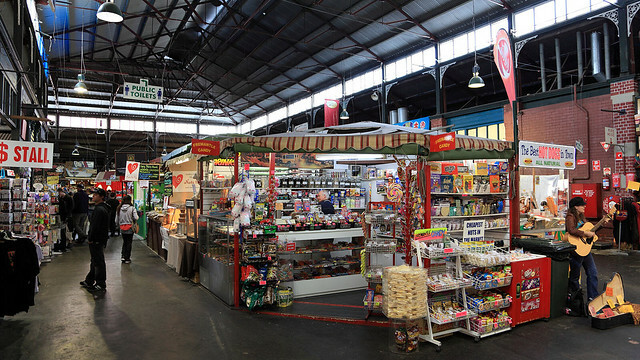 Once there, we walked down the main street to the Fremantle Markets. These were under cover, in a beautiful old colonial building and consisted of dozens of stalls selling all sorts of things, as well as a fresh produce section with fruit, vegetables, bakeries, cheeses, nuts, fish, and several hot food stalls, such as bratwurst, corn on the cob, spiral cut fried potatoes, and so on. It was varied and interesting, weith some decent looking items for sale in the various stalls. From the market, we walked down another street to the waterfront area. 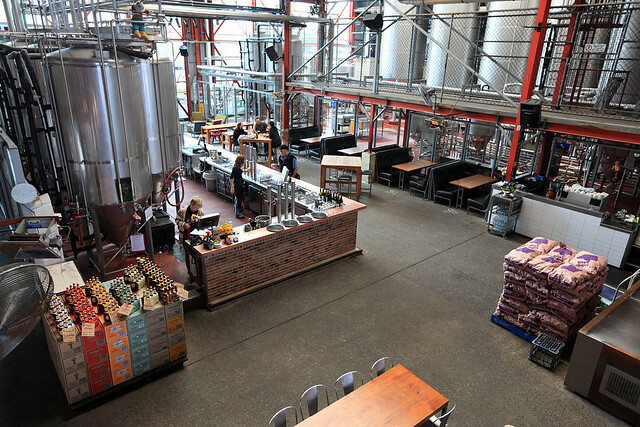 The first thing we saw was the Little Creatures Brewery, which we entered mostly out of curiosity to see the brewing vats and factory, which were exposed to see from within the bar and restaurant area that had been carefully woven into the middle of this working brewery. It was a large open building with vats and pipes and catwalks everywhere, including a mezzanine level which was partly open and populated with tables for patrons. The bar had beer on tap, direct from four large stainless steel vats. All in all, it was an impressive piece of industrial architecture. We stopped in and sat at a low table in some armchairs and ordered a cider for me. We sat and rested there for a while, absorbing the ambience. Then it was a walk along the boardwalk by the fishing boat fleet to two adjacent fish & chip shops. One had signs advertising fish & chips "voted best in WA", while the other had signs advertising "the original and still the best". Both turned out to be production line fast food style places, not actually cooking food to order. We looked in the first one, but it looked a bit dodgy, so I consulted the Lonely Planet and saw that it recommended the second one, Cicerello's. We queued amidst a group of other people and I ordered a basic fish & chips. We took it out of the packed indoor eating area to the al fresco seating on the boardwalk by the water, where for some bizare and unfathomable reason nobody else was sitting. The weather was fine at this point so I am mystified why this was the case. 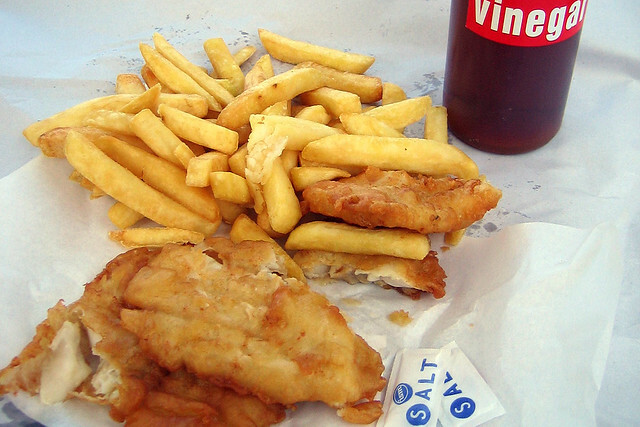 The fish & chips were excellent - lovely flaky fish, perfectly battered and fried, with chunky chips, golden and crispy. Seagulls eyed the food with their beady eyes, but didn't get anything from us. Done with that, we returned to the market, where M. got a scone and a carrot and date muffin for her lunch, while I grabbed a small raspberry cheesecake from the same bakery stall. Then we walked out again, down High Street to the Roundhouse - the oldest extant public building in Australia, which originally served as a small prison. This building is a small limestone structure with small windowless cells arranged around a central courtyard with a well in it. There was a set of wooden stocks there and a volunteer guide helped people into and out of them for photos. Leaving the Roundhouse, it started raining again, but not heavily. We intended to go to the Western Australian Maritime Museum, but spotted another market that M. had heard about - the E Shed Markets. The "E shed" came from the labels on a series of warehouses in the port area. So we checked this out first. Unfortunately, it was a polar opposite of the Fremantle Markets, being a dull collection of tacky and touristy junk for the most part. That done, we headed to the Maritime Museum, paying the $10 admission fee each. 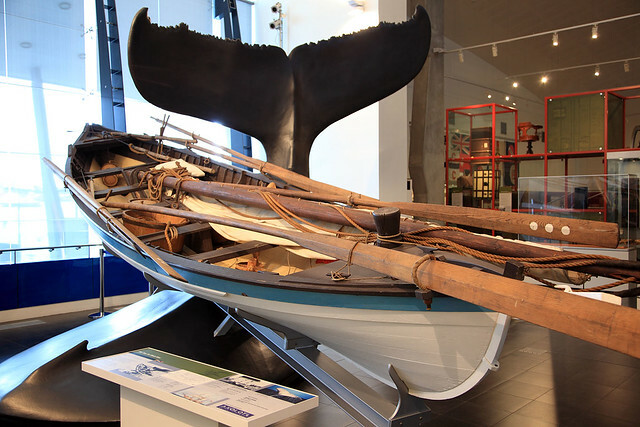 Over two levels and a mezzanine walkway, this museum presented a fascinating display of Western Australia's maritime history, concentrating on the fishing industry, Fremantle as the port of arrival of many immigrants from Europe throughout the early andmid 20th century, and the development and technology of shipping and sailing. 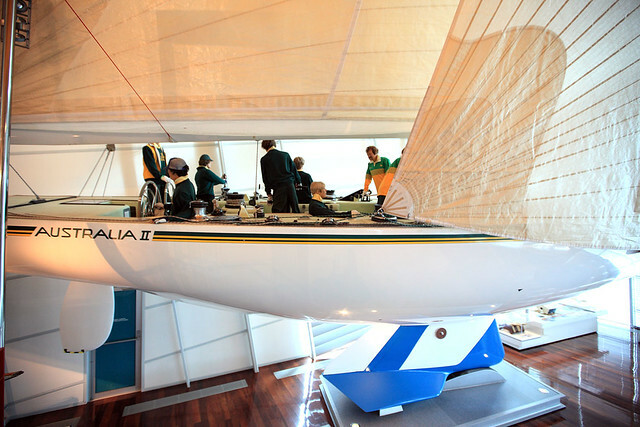 The latter culminated in the centrepiece attraction of the Museum, Australia II, the yacht that won the America's Cup in 1983 for the Royal Perth Yacht Club. By the time we'd been through the museum, we were getting a bit worn out and started heading back to the station to catch a train back to Perth. We popped in via the E Shed Market to get some dried fruit for a small afternoon snack on the way. Then as we were walking from there to the station it began raining with fat, heavy drops. We ran the last few metres to the station, bought tickets, and bustled on to a waiting train just a minute before it departed for Perth. Back in the city, we headed back to our room for a bit of a rest before heading out for dinner. 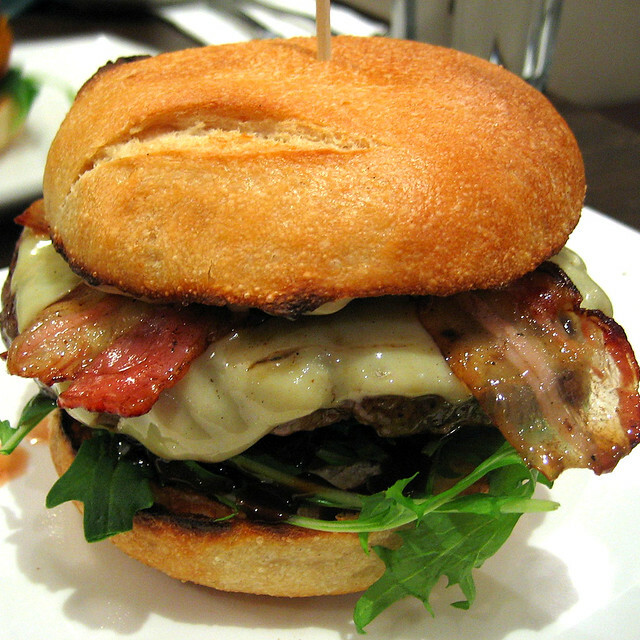 We left at 18:30 to go to a nearby burger place called Burger Bistro, in Shafto Lane. M. had a chick pea burger, while I chose the "Big Smoke" beef burger, with smokey pancetta and barbecue sauce, and we shared a bowl of chips with sour cream and sweet chili sauce. The burgers were very good. On the way back, we popped in to No. 44 King Street to get a take-away hot chocolate for M. Back in the room, I had half my last remaining yoghurt as a dessert, since the plan tomorrow is to go out for our last breakfast, but I will have a small bit of muesli first to offset the eggs or whatever I end up having. Last updated: Saturday, 09 September, 2017; 02:22:52 PDT.